The VILLA-V5-7RV is our 7-inch indoor, wall mounted, color monitor with front of screen touch buttons. It also included TFT touch screen capabilities. 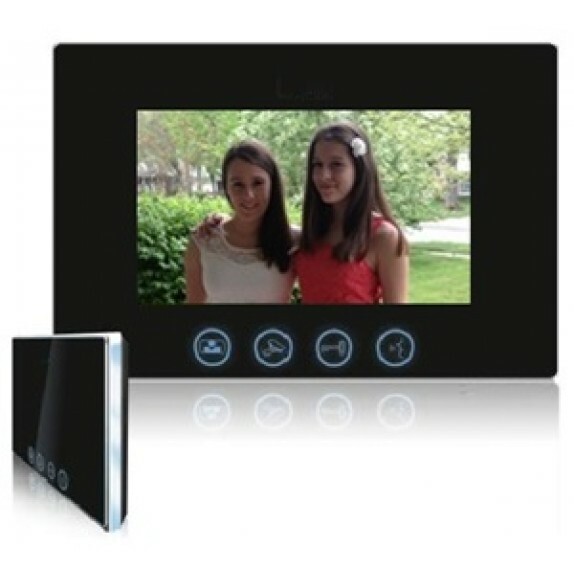 With its scratchproof, vandal proof, modern construction, the VILLA-V5-7RV color video monitor offers features such as two-way communication, full screen viewing, alarm, door unlocking abilities, card access and key fobs. Our VILLA-V5-7RV monitor requires 4 wires for audio/video and 2 wires for power for complete functionality, and it includes picture memory giving the capacity to save the previous 100 pictures taken at entry locations. Weighing only two pounds, the VILLA-V5-7RV video monitor is 9.5 inches wide by 6.25 inches tall by one inch deep, housed in alloy material similar to a laptop exterior. Our Villa video intercom system supports as many as 6 color monitors in order to accommodate single family homes.